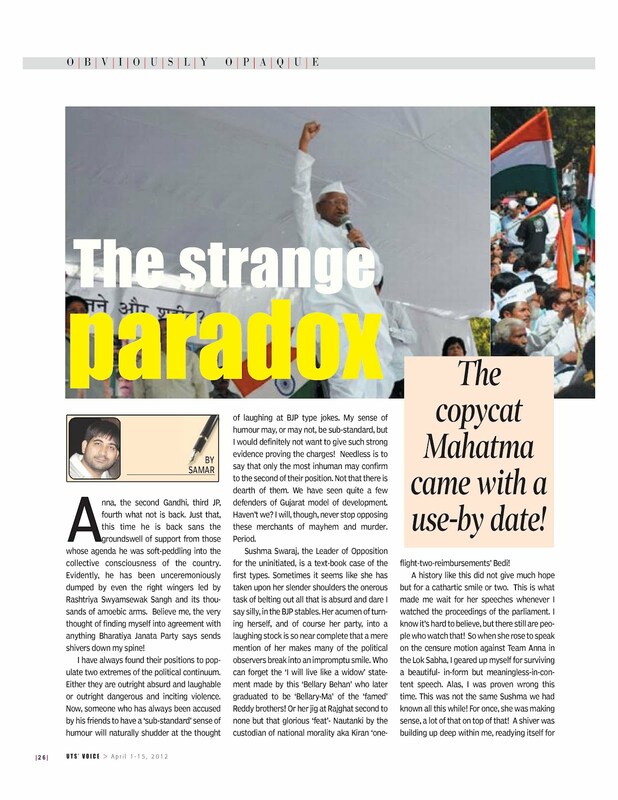 Reminiscences: Of a movement that was not and a Mahatma who came with a use-by date! Anna, the second Gandhi, third JP, fourth what not is back. Just that, this time he is back sans the groundswell of support from those whose agenda he was soft-peddling into the collective consciousness of the country. Evidently, he has been unceremoniously dumped by even the right wingers led by Rashtriya Swyamsewak Sangh and its thou-sands of amoebic arms. Believe me, the very thought of finding myself into agreement with anything Bharatiya Janata Party says sends shivers down my spine! I have always found their positions to pop-ulate two extremes of the political continuum. Either they are outright absurd and laughable or outright dangerous and inciting violence. Now, someone who has always been accused by his friends to have a ‘sub-standard’ sense of humour will naturally shudder at the thought of laughing at BJP type jokes. My sense of humour may, or may not, be sub-standard, but I would definitely not want to give such strong evidence proving the charges! Needless is to say that only the most inhuman may confirm to the second of their position. Not that there is dearth of them. We have seen quite a few defenders of Gujarat model of development. Haven’t we? I will, though, never stop opposing these merchants of mayhem and murder. Period. Sushma Swaraj, the Leader of Opposition for the uninitiated, is a text-book case of the first types. Sometimes it seems like she has taken upon her slender shoulders the onerous task of belting out all that is absurd and dare I say silly, in the BJP stables. Her acumen of turn-ing herself, and of course her party, into a laughing stock is so near complete that a mere mention of her makes many of the political observers break into an impromptu smile. Who can forget the ‘I will live like a widow’ state-ment made by this ‘Bellary Behan’ who later graduated to be ‘Bellary-Ma’ of the ‘famed’ Reddy brothers! Or her jig at Rajghat second to none but that glorious ‘feat’- Nautanki by the custodian of national morality aka Kiran ‘one-flight-two-reimbursements’ Bedi! A history like this did not give much hope but for a cathartic smile or two. This is what made me wait for her speeches whenever I watched the proceedings of the parliament. I know it’s hard to believe, but there still are people who watch that! So when she rose to speak on the censure motion against Team Anna in the Lok Sabha, I geared up myself for surviving a beautiful- in-form but meaningless-in-content speech. Alas, I was proven wrong this time. This was not the same Sushma we had known all this while! For once, she was making sense, a lot of that on top of that! A shiver was building up deep within me, readying itself for a parade down my spine. Was I finally in agreement with a point made by her? Wasn’t my head nodding, even if unconsciously, to her arguments? Maybe it was. I could not confirm more with her. The irony inherent in her statement was, however, lost on many. 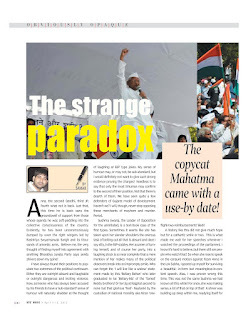 It was lost, I am afraid, even on the copycat Mahatma aka Anna Hazare. Listening to her statement would have made Anna tremble for it was almost a repack-aged version of a statement he himself had made a few years ago. I am sure he would want to erase that from the memory of the people, but then if only that was so easy. Mahatmas do not support murderers. Do they? Here we have one who actually does that. I know it would be hard for many to believe. But then this is what Anna Hazare had to say on Raj Thackeray’s tirade against North-Indians in Bombay (Yes I know it’s called something else now, but I would keep referring to it like this till that criminal wants to force the new name down my throat). Talking to media per-sons in Varanasi, Anna told them that “some ideas of Raj Thackeray were correct, but dam-aging public and national property was not right”. He had not stopped at that. He went on to ‘warn’ the North-Indians to live in their ‘lim-its’ by telling them that “outsiders trying to prove their dominance in the state was not at all acceptable". 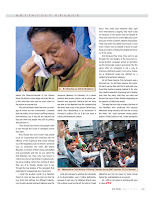 (Those not wanting to believe this are free to check the link -http://www.hindustantimes.com/India-news/UttarPradesh/Hazare-backs-Raj-s-tirade-against-Non-Marathis/Article1-368036.aspx or access the archives of Varanasi edition of Hindustan Times dated January 19, 2009). Mahatmas can be parochial too. Can’t they? Just that, in that case they should know to remain in their ‘limits’ and should not want to ‘dominate’ the national scene under a self-inflicted delusion of grandiose. Delusion, of course, follows its own course. It makes one believe into his ‘supernatural’, ‘super-democratic’ in this case, powers. It makes their followers believe in their ‘miraculous’ powers. And in believing all that they start claiming that the Mahatma is above everything, including the parliament. They were going strong. Electronic Media, in order to wash itself of the stains of Radia-Tapes, was working overnight to make a movement out of corporate-funded campaign. The copycat Mahatma was bound to be happy. So was his ‘Team’. Then, they made a mistake. Forgetting that their clientele (they loved to call them ‘masses’) hated politics but loved to use ‘contacts’, they sort of jumped into active politics. They decided to oppose Congress openly while clandestinely supporting the BJP. Palpably, whether or not their efforts of deluding the ‘masses’ have succeeded, they have deluded themselves into their invincibility! If only they knew that Mahatmas too come with a use-by date. This date, in turn, depends upon their capacity of delivering ‘goods’, votes in this case, to their masters. This parochial Mahtama, bolstered by the defeat of Congress where it was not even in the contest, decided to give an open call for defeating the Congress-NCP alliance in the local civic-body elections in his home state. And bingo, the combine won more than two-third of the total seats! ‘Just one’, was what the Mahatma had cunningly asked after listening to the news of Sharad Pawar getting slapped in Delhi. The slap has landed, now, on his face. Unlike the Mahatma, though, I am not interested in count-ing the numbers. The Mahatma had failed to deliver. Team Anna should have taken that defeat as a wake-up call. They did not. They decided, instead, to gang up openly in support of the BJP, choosing Uttarakhand as the new battle-ground. Throwing any remaining pretensions of impartiality out of the window, they called upon the masses to defeat the Congress. They should have stopped at that for in a state with bipolar politics, the call had effectively meant the same as supporting the incumbent BJP. They did not. They decided to turn themselves into something like court-poet of the incum-bent Chief Minister B C Khanduri and exhorted his virtues in a chorus. The people, who were all Anna and those who were not Anna were with Anna, listened to all this intently and then defeated the ‘honest’ chief minister in his own constituency! The writing was now on the wall. The Mahatma, with his team, was well past its use-by date. They should have realised that scripts work for performances, right from plays to films, and not for movements. They should have realised that the same people, who clap and whistle against the demonized & vilified politicians in the darkness of an auditorium, vote for them in brightly lit polling booths. They should have known that in a country where even Masala films bomb at the box-office, a Masala ‘movement’ armed with the props ranging from the Tiranga to Topi was destined to tank. They should have understood that under their carefully woven pretence of a homogeneous crowd lay a thousand fault lines dividing the people along the axes of caste, kinship, clan, religion and what not. They should have known that every single time their leader, the liberator-people-were-waiting-for, would make statements alluding to ‘chandal chaukari’ or Banjh Aurat (barron women), a section of the populace will get a glimpse into real psyche of his herds and will get alienated. They should have known that accommodating those who attend the Dharma-Sansads of the Vishwa Hindu Parishad on their stage will scare life out of the minorities who have as much claim on the nation as anyone else. They should have known that one can man-age an event, but not a movement. I concede that the politics of our times is drifting towards performances, but it has yet not reached the ebb and there are people who still do politics than perform it. They should have known that people were to see through the script of Janlokpal sooner than later. They should also have known that people could be hoodwinked into believing into the efficacy of the ‘supercop’ that would emerge out of the legislation, but not forever. Someone was to remember the other Bill Shanti Bhushan, a member of Team Anna, had drafted and successfully sold into an act, called the Anti-defection act. Then s/he was bound to notice how the act had ended in institutionalizing horse trading rather than curbing it. More than any of it, though, people were to see through the real designs of the campaign that pretended to masquerade as a movement. I recall the prudent words of a Pakistani friend of mine. He has once told me that the only thing that defines the different trajecto-ries of post-colonial India and Pakistan was the presence (absence for Pakistan) of a robust political democratic system, one in which parliament was supreme. Pakistan did not have one and so the deprived and the marginalized did never have a say in the system. Democracy, rather than dictatorship is an aberration in Pakistan’s political life for it did not have a robust parliamentary system. India did manage to address the demands of its downtrodden, even if rather deficiently, because it had one. If a Pakistani friend knew this, Indians could not be left far behind. Could they? They knew that whatever little, right from reservations to dignity, they have found are because of the system and not despite it. They have seen the rise of the OBCs that came because of their numbers, hitherto impossible. They have seen how Dalits have found a voice even if much more is needed to done for justifying any claims of being the largest democracy of the world. And because they knew, they were to see through the real designs of the Anna-led-corporate-funded campaign aimed at demolishing the democratic system and dump it for the same. After all, scrapping is not a way to improve a deficient system, more so by impos-ing a dictatorial super-cop defined by a casteist and sectarian ideology. For all these reasons, this campaign was a doomed one. For all these reasons, the messi-ah had a use-by date and that is well past now. Good that Sushma Swaraj realised it, for who has a better expertise of jumping out of sinking ship than her party. Had they not used and thrown the issue of Ram Temple depending on its capacity of delivering votes! This was the irony lost on many, the irony of the handlers who produced this copycat Mahatma being forced to tell him not to cross the limits. Did I hear someone saying poetic justice? Poetic justice or not, I loved seeing this Mahatma put into his place by those whose hatred for real Mahatma is no secret! P.S. I still do not agree to anything BJP says or does. Could you be more poignant!!! Bravo Samar Bhai! Loved this one!